Literature review; The emerging market of China; Patterns of foreign R&D in China; Motivations and challenges of foreign R&D in China; Managing R&D professionals in China; Managing intellectual property rights; Managing cooperation with local universities; Conclusion and outlook. The undertaking of R&D in China by foreign organisations is explained through an analysis of the patterns of foreign investment in R&D and the motivations and challenges for undertaking R&D in China. 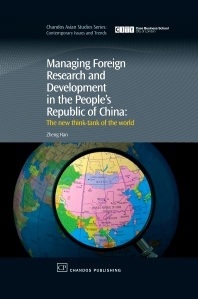 The book provides a detailed reference source which outlines the general environment of R&D in China through governmental policies, Chinese domestic science and technology systems and contemporary developments of intellectual property protection. The practical implications for companies intending to set up R&D in China are also discussed. Dr Zheng Han, a native Chinese, studied in Germany and holds a combined Master in Mechanical Engineering and Business Administration. At the Asia Research Centre of the University of St. Gallen in Switzerland, he is working as research associate, consultant and lecturer. He is a scholar of the Swiss National Science Fund and a visiting scholar at the China Europe International Business School in Shanghai, China and at Wharton-SMU Research Centre in Singapore. Zheng HAN has gained relevant experience at companies including McKinsey & Company and the Research and Technology division of DaimlerChrysler in Germany.